Is a 1980 Weather Pattern Good For U.S. Crops? With U.S. corn and soybean crops in the midst of the always volatile and unpredictable growing season, the only thing certain with this year’s crop at this point is uncertainty itself! Market participants anxiously await the latest and greatest weather model runs released by various meteorologists in what seems like hourly fashion this time of year. While seemingly always viewed by the market as too hot, too dry or too wet, weather forecasts play a vital role in market direction. 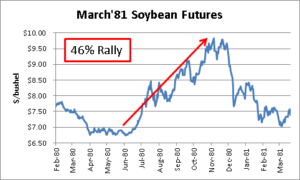 With commodity markets, weather forecasts are often compared to similar weather patterns of past years so that comparisons of yields in those years can be related to potential outcomes of the current crop that’s in the ground. There are some 2016 “drought mongers” out there, i.e. meteorologists forecasting a drought in the U.S. this summer, but that is typical of every year as someone always tries to kill the crop at least a couple of times. One theme in the forecasts we have been hearing that sticks out to us at GRM is the call for the U.S. in 2016 to have a similar weather pattern than that of 1980. That same forecast stated NO 2012 like drought this summer was to occur and also called for no major summer growing problem in any of the major World production areas. A person reading that forecast may have gotten the sense that, since this summer would be nothing as severe as 2012 and that the rest of the world would have no weather problems, buyers could “relax” because everything would be “ok”. Is that the case? 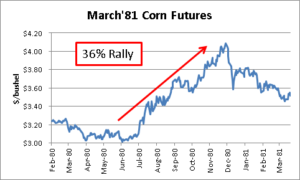 While GRM is certainly not in the business of predicting the weather, we do know how to look back at the history of crop production and commodity price action and we can tell you that IF Mother Nature decides to party like its 1980, it is not good if you are a buyer of grain and oilseed commodities. 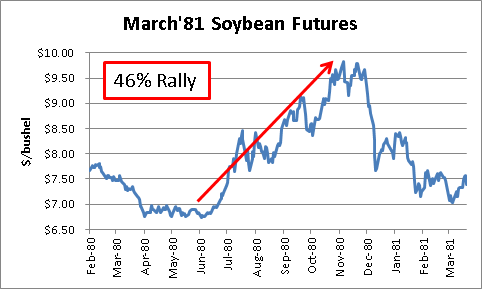 1980 was a drought year and a similar yield impact this year would send grain and soy prices skyrocketing higher this year. Although 1980 was not near the severity of the drought in 2012 (which was the worst since the Dust Bowl), be aware that it does NOT require a summer drought as severe as 2012 to send prices much higher from current levels. -In 1980, both corn and soybean yields were 12% below trend. Using 2016 trend yields of 167.2 and 46.2 bushels/acre respectively, a yield 12% below trend in 2016 would imply corn and soybean yields of 147.1 and 40.7 bushels/acre versus the current USDA forecast of 168 and 46.7 bushels/acre, respectively. -Plugging those yields into the current USDA U.S. 2016-17 corn and soybean balance sheets significantly reduces ending stocks before demand rationing. 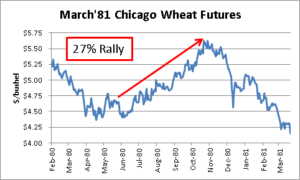 -1980 was one of the worst years for spring wheat yields, given that the 1980 spring wheat yield was 16% BELOW trend. This would imply a 2016 yield sharply below the USDA’s June U.S. Spring and durum production forecast. -The 1980 winter wheat crop was excellent at 104% of trend. In fact, at the time, it was essentially a record yield at 36.8 bushels/acre (1979 was 36.9). Interestingly, the USDA forecasts that the 2016 U.S. winter wheat yield will be a record. 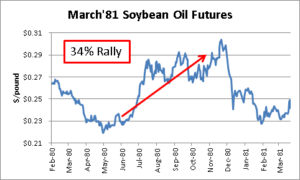 -Prices of corn, wheat, soybeans and soybean oil all saw significant rallies from June 1st into the November highs (36%, 27%, 46% and 34% respectively). See below charts.